Siphon Brewing Tap Takeover + Ale Tales Pre Festival Party! Join us on the last day on the month for a very special Siphon and Verzet tap takeover, and try two of the most exciting new Belgian breweries. 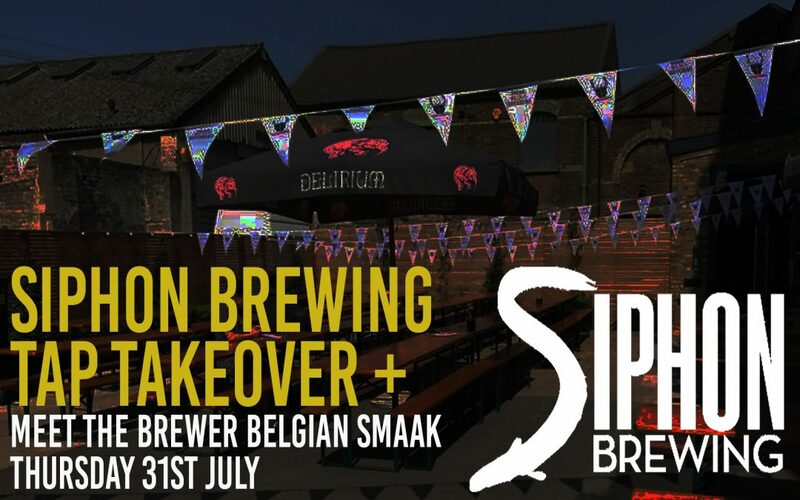 Siphon Brewing only celebrates its second birthday this July, but has already got a reputation for making hugely flavourful, modern twists of traditional Belgian beer. Taking its name from the restaurant where it brews, the brewers there make everything from session rye ales (3.3% abv) right up to vanilla and orange infused quads. Our favourite is their delicious bittersweet Belgian IPA, Damme Nation. The other brewery on the taps will be Verzet, another young brewery but one making big waves, in particular with their flagship oud bruin which is a wonderfully balanced version of this classic style. As well as having their core oaky, cherry-like brown ale they have aged it over all kinds of different ingredients including a delicious raspberrry version and a unique oak leave variant. Book an area in the bar here!